I have to admit. I've recommended super setting during fat loss phases before, too. It simply appears too logical to assume that with the decreased rest times you'd burn more energy and - as you, as a SuppVersity reader know - it's your energy deficit that determines your weight loss. Unfortunately, a recent study from Brazil has recently disillusioned me within less than one second - the title was enough: "Supersets do not change energy expenditure during strength training sessions in physically active individuals" (Brentano. 2016)... until I realized that it fooled me to believe that we were talking about a comparison of super setting to super setting... synergistic and non-synergistic that is. No matter how you train. You must periodize appropriately to maximize your gains! What? Yeah, the scientists from the Federal University of Rio Grande do Sul measured the energy expenditure (EE) during standardized strength training (ST) of 20 subjects who were assigned to either a "grouped exercise" (GE: 26.6 ± 3.4 years) or a "separated exercise" (SE: 24.9 ± 2.6 years) - both of them superset protocols, albeit one with synergistic (grouped) and one with antagonistic (separate | actually, this was rather "non-synergistic", as you will learn in minute. ST: strength training; VO2: oxygen uptake (Brentano. 2016). From previous SuppVersity articles, you will know that the number of studies that investigate the physiological response to super setting is very limited - information about the influence of how you combine your sets is simply non-existent. Thus, Brentano, et al. (2016) aimed to determine whether supersets of ST exercises influenced EE during and after one strength exercise session, even doesn't exist - at all. 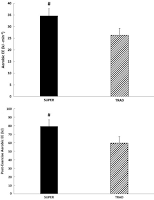 Intra- and post-workout aerobic energy expenditure with super setting and traditional resistance training (Kelleher. 2009). Yes, I fully agree... this study lacks a "non-supersetting" group: I personally would rather have preferred to learn whether super setting increases intra- and post-workout EE compared to regular training. Luckily, this study has been done before. 7 years ago, when Kelleher et al. published their paper "The Metabolic Costs of Reciprocal Supersets vs. Traditional Resistance Exercise in Young Recreationally Active Adults " in Journal of Strength & Conditioning Research - a study that shows no sign. differences in aerobic EE during super setting vs. traditional exercise (SUPER 1,009.99 ± 71.42 kJ; TRAD 954. ± 83.31 kJ), p = 0.371 - despite what appears to be a consistent elevation in oxygen consumption for SUPER above TRAD in Figure 1 (top). A sign. effect was observed, however, for the post-exercise excess energy consumption (EPOC), which increased by a whopping 33% - sounds like much, but with an absolute difference of only ~4.78 kcal per workout (SUPER 79.36 ± 7.49 kJ; TRAD 59.67 ± 8.37 kJ) that's as irrelevant as the non-sign. 7% (= 0,25 kcal/kg body weight) difference in the total metabolic cost of the two workouts, i.e. SUPER (15.52 ± 1.13 kJ/kg body weight) and TRAD (14.52 ± 1.17 kJ/kg; p = 0.265). Hypertrophy oriented - All exercises were performed at the load obtained during the 10 RM tests; therefore, both sessions were conducted with loads equivalent to 85% of 10 RM. Grouped exercises (GE) - During GE, the participants performed one set of the leg press exercise, immediately followed by one set of the knee extension exercise, with no rest between each exercise. After five sets, the participants performed one set of the bench press exercise, immediately followed by one set of the pec deck exercise, with no rest between each exercise. Separated exercises (SE) - During SE, the participants performed one set of the bench press exercise, immediately followed by one set of the knee extension exercise, with no rest between each exercise. After five sets, the participants performed one set of the leg press exercise, immediately followed by one set of the pec deck exercise, with no rest between each exercise. Standardized rest - In both GE and SE, there were 3 minutes of rest between every two exercises (superset) to minimize the decrease in total work for subsequent sets. "Total work during the session and increases in lactate concentrations were similar between the GE and SE Groups. During exercise, EE was greater in the SE Group when compared with the GE Group (GE: 123.8 ± 14.36 kcal vs. SE: 131.77 ± 20.91 kcal). During the postexercise period, GE induced greater EE when compared with SE (GE: 25.12 ± 7.86 kcal vs. SE: 19.76 ± 5.53 kcal)" (Brentano. 2016). What? Doesn't that mean that the EE did differ? Yes, it does, but the exercise sequence did not influence the previously cited, most relevant parameter, the overall EE (GE: 148.92 ± 18.72 kcal vs. SE: 151.53 ± 17.97 kcal, p = 0.920). Accordingly, the scientists rightly say that "in physically active men, ST supersets do not influence total EE during and 60 minutes after a single session" (Brentano. 2016). Supersetting is fun, time-efficient, exhausting and based on the reasonable assumption that you can benefit from training agonist + antagonist together, but does it build size & strength? I knew that this is what you were about to ask on Facebook... luckily, I've answered this question before - in this 2015 article! So what? Eventually, it takes the Kelleher study discussed to draw a practically relevant conclusion because most of you will probably be interested in an answer to the question "Should I or shouldn't I superset?" Now, it should be obvious that you shouldn't base this decision solely on the amount of energy you can spend during a workout, but if that is an important criterion for you, because, e.g., you want to shed some body fat and could use the extra 100kcal of energy expenditure many people will believe super setting may entail, I have to disappoint you: In conjunction the studies by Brentano (2016) and Kellehrer (2009) clearly indicate - a practically relevant difference between the intra-, post- and total-workout energy expenditure of traditional and superset training does not exist... or do you consider 4kcal significant? | Comment on Facebook!" Brentano, M. A., et al. "Supersets do not change energy expenditure during strength training sessions in physically active individuals." Journal of Exercise Science & Fitness 14.2 (2016): 41-46. Brennecke, Allan, et al. "Neuromuscular activity during bench press exercise performed with and without the preexhaustion method." The Journal of Strength & Conditioning Research 23.7 (2009): 1933-1940.